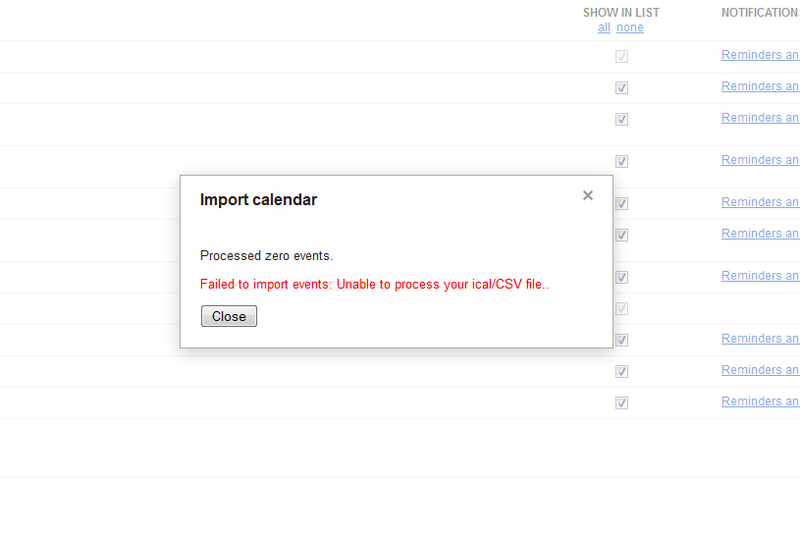 Failed to import events: unable to process your ical/CSV file..
… that is what I get when I try to import a freshly exported ics file from my Google Calendar. The problem is a quote (") in one of the ATTENDEE sections of an event, a section that is not even re-imported when adding it to a fresh calendar… Removing those quotes made Google import the events. It took me quite some time to accomplish since I had to find out which one of the 1470+ events would be the culprit, but it was worth the work. Exporting and re-importing the same calendar events without removing the originals made my Android Calendar sync all my events so that I now have not only the events of the last 60 days on my phone, but all events since the first time I started using Google Calendar.